At Techcon ARM announced 11 new POP products to a world that mostly replied, “What is POP?” That is a good question so lets take a look at what ARM POP is and why you should care about it. The short story is that POP used to stand for Processor Optimization Pack but now it doesn’t actually stand for anything other than a name for ARM’s physical IP line. Other than sounding better than PIP, POP is the basic Lego block of the ARM world, the designs the firm licenses implemented at various foundries in an optimal way. Not all products are offered as POP, but as of Techcon that list grew by 11 offerings. Just what does ARM offer as physical IP? Just about everything a customer will want as you can see above, but that is not a comprehensive list by any means. On the process side there are at least three more modern processes supported, 65nm, 55nm, and 45nm plus all of the high performance, low power, and market specific variants of these eight offerings. On top of that there are six listed CPU cores, five GPUs, and six classes of other devices too. These are the tip of the iceberg, there are probably hundreds of individual offerings to pick from. What foundries offer POP products? ARM lists off TSMC, Global Foundries, Samsung, UMC, SMIC, and IBM in their presentations, that is just about everyone for current nodes. When talking about 28nm specifically ARM said they have offerings on every commercially available 28nm process out there. This however does not mean that every core, GPU, and block is available on every process, many combinations just make no sense at all so they aren’t offered. That said the items that are well suited to a given process will likely be available to customers. Why would you want POP if you license the design from ARM in the first place? That one is easy enough if you think back to the original name, Processor Optimization Pack. In short this is a version of the core that ARM has already sweated the details on for transistor choices, layout, and all the little things that make life hard for SoC designers. This isn’t to say that a POP offering is perfect and no one can do better, you can if you want. The key here is that if you want it will take a lot of time, money, engineering, and foundry cooperation to get everything tuned just the way you want it. What can you do with a piece of POP? As you can see from the diagram above you can make a large portion of a modern SoC with ARM POP blocks but not all. There are things like a video encode/decode block, caches, and other units simply missing from the ARM offering but it wouldn’t surprise SemiAccurate one bit if some of them popped up, or is that POPped up, in the near future. Luckily for the customer most if not all of these offerings are available from third-party IP houses in one form or other and the blocks that ARM does offer are just one of a list of options. Because one of the major drums being beaten at Techcon 13 was the Internet of Things (IoT), ARM pointed out that once they have a POP product, it doesn’t go away just because a newer and better core, process, or trend happens along. What was a bleeding edge RISC CPU from 15 years ago is now the perfect starting point for a connected smart shoelace tip controller. There are a lot of companies squandering VC money developing such health and fitness devices that promise to change your life so it is a hot market. The official SemiAccurate position is to scoff at realtime herbal suppository efficacy chips and heads-up ear position sensor silicon but if you want to build the next great smart nasal flow particle counter, ARM can help. In addition to the tiny 65nm and smaller devices above, there are POP version of the Coretex M0, M0+, and for those who live in the fast lane M3/M4s as well. These are available on processes ranging from a sensible 250nm down to a racy 90nm should your shoelace tip need the speed. Who can you get these from? The ones SemiAccurate has heard of are Global Foundries, Hynix, IBM, Magnachip, NEC, SMIC, TowerJazz, TSMC, and UMC. Added on to that list are ones we have no clue about but if they want to bring us up to speed on their offerings, we would love to hear from them. These include CSMC, Dongbu HiTek, FAB, HeJian, SilTerra, Vis, and one that starts with a G followed by a bunch of Mandarin characters that we have no idea how to read. In any case the list is long. What are the new products? There is an A7 on Samsung’s 14nm process and an A57 on TSMC’s 16nm process, both are FinFET based. On top of this there are nine new processes supported, two high performance 28nm variants and four new Poly SiON 28nm versions. This is the basis for ARM claiming to be on all commercially available 28nm processes in case you didn’t connect those dots. On 40/45nm there are two new offerings as well along with the one you have been waiting for. 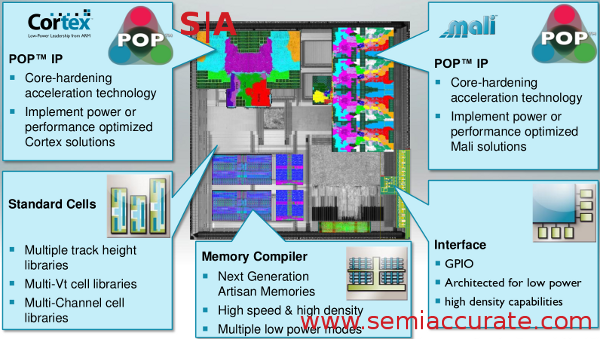 Yes it finally happened, ARM has POP offerings on TSMC’s 55nm process. Beware Intel, the circle is now complete, the puny 14nm A53s you are going to make had better watch their backs. When will the 290 partner boards arrive?